I had hoped to see the scrap train from Handsworth as well, but that ran several hours late, at least the light was reasonable when the 37s came through. This entry was posted in Sharpo's World Photo Updates on June 29, 2011 by Sharpo. Lunch at Bewdley, and a few photos. 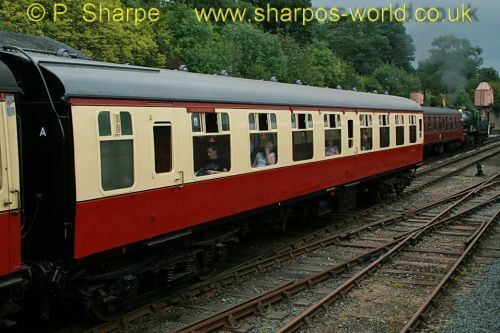 M25498 looked very smart with a fresh coat of carmine & cream paint. The Class 20 was in action shunting some wagons and the 2 steam locos were working trains. 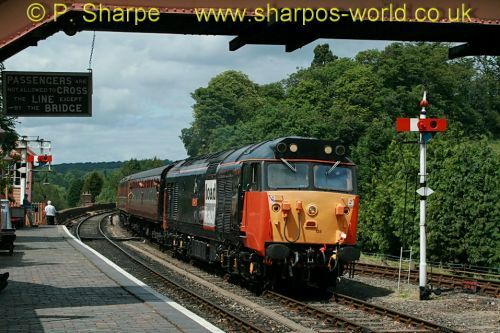 This entry was posted in Sharpo's World Photo Updates on June 28, 2011 by Sharpo. 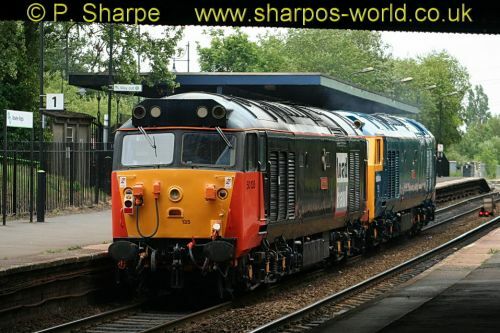 50044, recently overhauled at Cardiff, is seen arriving at Kidderminster to collect 50135 for movement to the East Lancs Railway diesel gala. 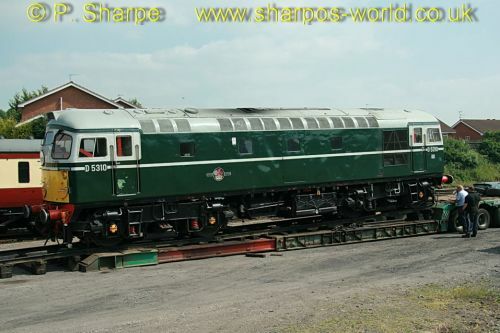 Other locos were to be collected from the Midland Railway Centre on the journey north. I had time to travel to Rowley Regis for more photos. The locos were booked into Rowley loop, but did not stop there. 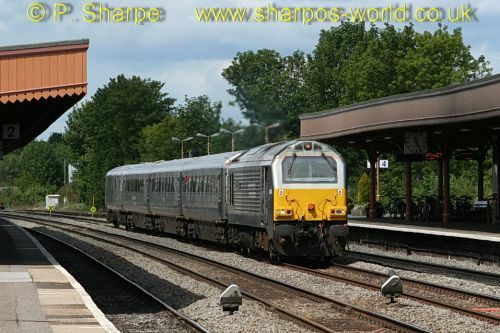 I thought they might stop in Langley Green loop instead and caught a train to Smethwick – they were in Langley loop, and I had time to find a location for a shot at Smethwick. These photos are from a few weeks ago. Just an ordinary weekday, but 37906 was in action, going towards Arley with a single wagon. 43106 was back in service after many months, complete with “flying pig” on lamp bracket, and 5164 & 42968 were also working trains. Finally, at Kidderminster, D5310 is seen being winched onto a trailer to return to Llangollen. 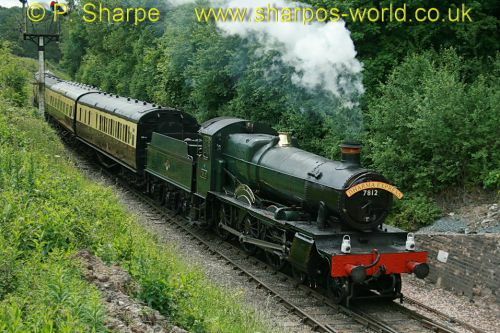 This entry was posted in Sharpo's World Photo Updates on June 21, 2011 by Sharpo. It was a dry day & KC had her walk to Bewdley station, followed by a train ride to Arley & back. 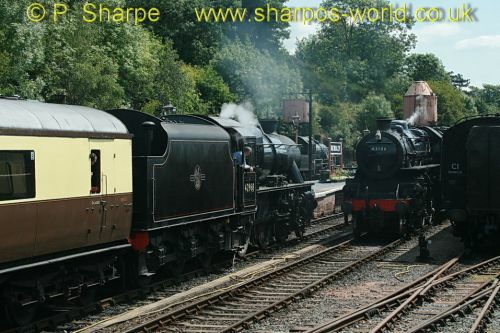 The same 4 steam locos as the previous day were working services & 50135 was on a Driver Experience. Locos running backwards rarely make good photos, but if you get a reasonable side view it’s not so bad. This entry was posted in Sharpo's World Photo Updates on June 20, 2011 by Sharpo. Just coming up to the longest day of the year, still behind with gardening and, as always, behind with my photo updates. These photos were probably uploaded a week ago, but I forgot to add them here. Only photographed 2 trains, so just for the record. My weekly treat, if it comes this way, the flask train. Patience was needed this time as it stopped in the loop at Stourbridge for about an hour & a half. 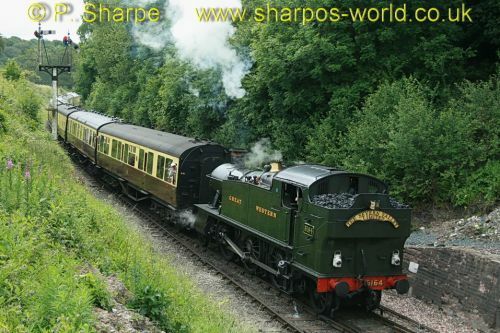 This entry was posted in Sharpo's World Photo Updates on June 18, 2011 by Sharpo. A few hours at Bewdley today saw the above locos working trains. 5164 was on a charter with a saloon, the others were on service trains. D8059 was busy shunting in between trains passing through, but was in the distance & not photographed. Let’s have a diesel for a change! Just the usual hour or two at Bewdley with several trains passing by. 7812 & 43106 were on service trains & 42968 was on a charter. This was a lucky photo, 3 locos in the same shot, 46443 was in the background. 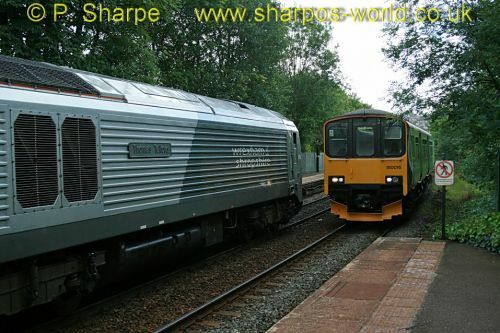 This entry was posted in Sharpo's World Photo Updates on June 15, 2011 by Sharpo. Whilst on holiday in Cornwall, we called in at Bodmin to see 30120 – a loco I haven’t seen run for a very long time. It does make a change to see something different to those at the SVR. 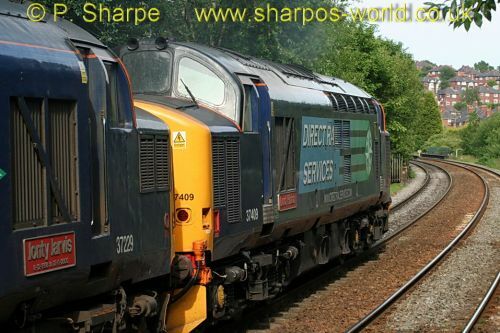 This entry was posted in Sharpo's World Photo Updates on June 14, 2011 by Sharpo. My other site has all the Tornado photos, but I have included 2 of them here. There are many photos of the Chiltern training runs, especially the one from Stourbridge – seen at Old Hill & Moor Street as well as Leamington. 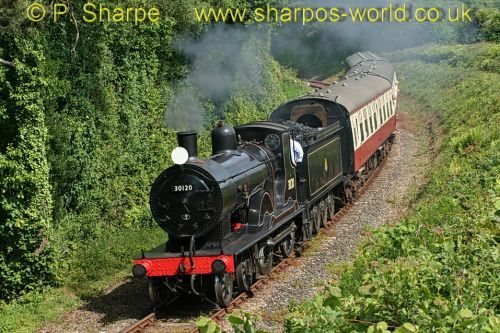 This entry was posted in Sharpo's World Photo Updates on June 10, 2011 by Sharpo. I’d heard there was another training run from Stourbridge today & managed to get back from Bridgnorth just in time to see it. Only had to wait about 4 minutes for it to appear, probably checked by signals as the preceding DMU would have stopped at Rowley Regis. Typically dull weather round the “Dark Side”! As is usual with Old Hill, the spare path almost always coincides with a train running in the opposite direction – a real nightmare, as the photo shows.